30+ million Americans have diabetes and 7 million of them don’t know yet that they have it. Type-2 diabetes is more common and usually occurs in people over 40. Diabetes of whatever type is an extremely serious condition. The below mentioned ideas do not imply curing/reversing it. Instead they promote simply ideas for better self management. While bitter gourds are not loved vegetables for their taste, it is a super effective weapon against diabetes. It’s an amazing blood purifier and you can eat it or make a glass of juice out of it. Cinnamon lowers blood sugar levels as it contains bioactive components that stimulate insulin activity. You can boil water, add 2-4 cinnamon sticks, strain it, and cheers! A study by Newcastle University found that a very low 600 calorie per day diet was effective in treating Type 2 Diabetes. Such a diet will typically involve replacing conventional foods with diet milkshakes, soups or bars. Mango leaves are not only tasty but do also regulate insulin levels in the blood and can help improve blood lipid profiles. It sounds strange but indeed getting some sunlight does the trick against diabetes. Sunlight triggers vitamin D which in turn boosts the insulin production. 6. Drink Green Tea and water! In contrast to other tea leaves, green tea is unfermented that helps control the release of blood sugars. Harvard researchers found that fish oil supplements (omega 3 fatty acids) consumed by 37% of adults in the US increase levels of certain hormones which positively influence the insulin production. Grapefruit is the Swiss army knife for diabetes. Eating up to three of these buddies per day is the perfect medicine against diabetes and also helps you to lose weight. This remedy can’t be missed. Oatmeal is important is it adds whole grains to your menu. It’s a major source of soluble fiber that regulates blood sugar levels. Juice fasting can be an effective step to managing diabetes. Juicing is a quick way to consume large amounts of fruits and vegetables each day. Why not trying out a spinach juice involving 1 bunch of baby spinach, 2 apples, and the juice of ½ lemon? 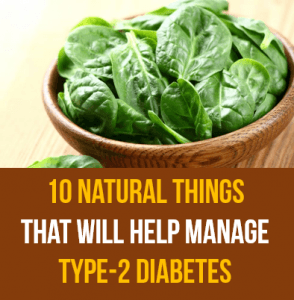 See here even more ideas to better self manage diabetes.